Online hotel guest reviews are invaluable to hotels, today. And honestly, each of us would vouch for this. 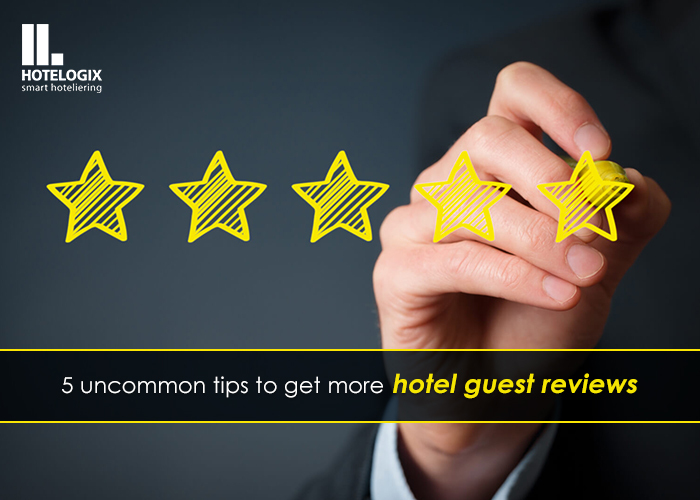 Get a feedback mechanism in place to get your guests to leave you reviews. Send emailers with online feedback forms, or hand out those forms (not the best option in this day and age! ), incentivize guests to leave a review on review sites, go all out on this because this is the foundation to a whole range of benefits. Once you’ve received your first set of reviews, make sure you look into each one of them sincerely. Closing the loop on feedbacks is as important as getting them. When a guest has put in the effort of giving you a review of their stay with you, you need to respect the time they’ve given you. Read the review and see if there is something in there that can be worked upon. After carefully going through these reviews, make sure to respond to each of them. This can be handled either by you or a dedicated staff. If you are a big hotel group, investing in a hotel review management system can prove beneficial. With a cloud-based PMS, like Hotelogix, automating guest feedback emailers is a cakewalk. All you need to do is to define the content of the mailer that you wish to send out to your guests. This is a customizable feature. Once that is done, every time a guest checks out, you can trigger this mail with the click of a button! There’s a lot more that our PMS can do. We’ll be happy to run you through them! Responding to online guest reviews has multiple benefits. For starters, it communicates to the reviewer that you actually pay heed to what he or she has to say, because most often nobody takes the pain to respond to reviews. So, when you do respond to them, it sends out a clear message that your hotel values the customer’s experience and that feedback is important to you. Responding to online reviews is a great way to build an association with your guests as well as prospective guests! It also helps build trust with prospective guests that you treat guests with care and respect, and not just as a transaction. Third, it helps you win back those guests who may have been disappointed with a certain aspect of their stay. This is possible when you take negative feedback seriously and address the cause of disappointment and get back to them on the same platform assuring them that you have fixed it and welcoming them back to your hotel to check it out! This way, you are closing the loop with that guest in a way that he or she may never have anticipated! These stats are not to be treated lightly. Think about it! Negative reviews can really put anyone out of business. And if all you have to do to get rid of negative feedback is respond to your online hotel guest reviews, there is no excuse to avoid it. The hospitality industry, unlike many others, is heavily dependent on the “human” aspect. Regardless of how much technology claims to be capable of doing, it still cannot replace a sincere apology or a heartfelt note of gratitude that you or your staff can share with your guests. And that, I believe is where your treasure trove lies. Connect to that human aspect and respond to your guest reviews. Not only is this the right thing to do, but also statistically the more lucrative option for you!